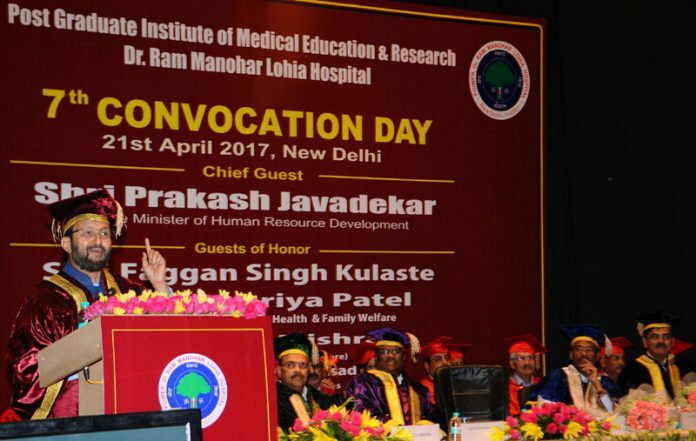 The Union Minister for Human Resource Development, Shri Prakash Javadekar addressing at the 7th convocation ceremony of the Post Graduate Institute of Medical Education and Research (PGIMER) Dr. Ram Manohar Lohia Hospital, in New Delhi on April 21, 2017. New Delhi: Union Minister of Human Resource Development, Shri Prakash Javadekar has exhorted upon young Doctors to go for ethical practice in their profession and perform that duty with passion. He said only passionate work can bring satisfaction in life. Shri Javadekar was addressing the 7th Convocation Day of Post Graduate Institute of Medical Education and Research (PGIMER), Dr. Ram Manohar Lohia Hospital in New Delhi today. Shri Javadekar said like a teacher only that Doctor is remembered and honoured who behaves humanly and who has more human traits. So he gets respect from everyone. He reminded the Doctor of the contributions of society in their entire education in the form of tax paid by them He said a Doctor can earn quiet sufficiently in a practice being ethical as it will definitely return him with lot of satisfaction and good amount of living. ‘So be happy, be satisfied, prosperity will follow’, he added. Shri Javadekar referred to the steps taken by Central Government in reducing the prices of stents used for curing heart blockages from Rs. Two Lakhs to 26000 and from Rs.70-80,000 to Rs.7500. He said similarly efforts are being made for generic medicines so that their extensive use could be done. We have also started Janaushadhi stores to provide generic medicines at cost effective and reasonable prices so that the poor could afford for medicines easily. Promotion of YOGA and observation of YOGA Day is meant for prevention of diseases and attainment of good health, Shri Javadekar added. Similarly are the drives for vaccination, immunisation, physical activities, barring of junk food, and sports, the Minister said. Shri Javadekar called upon the young Doctors to come up for the service for the nation as a soldier keeping in mind even the smallest contribution made by a layman. On this occasion 135 Students were conferred the Post Graduate Degree of the Institute in different disciplines. The event was also addressed by Minister of State for Health and Family Welfare Shri Faggan Singh Kulaste. Health Secretary Shri C.K. Mishra and other senior officers were also present on the occasion.